A Public Meeting is planned for Tuesday June 30th beginning at 7 PM in the Community Center (across from City Hall), Delta Junction AK. Current Status: The Healy Lake Fire started on June 16, 2015 approximately 28 miles southeast of Delta Junction, Alaska. The cause was lightning. The acreage total today is 10,130. The fire is reported as 15% contained. Goals: Healy Lake Fire – Plans are to 1) Ensure all suppression actions are prioritized, emphasizing firefighter and public safety through the implementation of sound LCES (Lookouts, Communications, Escape Routes, and Safety Zones), 2) Protect the community of Healy Lake Village and cabins on Healy Lake and Hidden Lake, 3) Protect Native Allotments, infrastructure and cultural resource values by coordinating with a Resource Advisor and following MIST (Minimum Impact Suppression Tactics), 4) Minimize traffic delays due to smoke impacts on the Alaska Highway. Planned Events: We are preparing long-term fire management plans that will identify appropriate responses to fire activity as it develops. Healy Lake Fire – Crews will continue point protection around structures, burning out when needed. Structure preparation is being conducted on numerous values at risk. Spot fires will be secured using a 100% mop-up standard. Contingency line location on the north flank of the fire is being identified. Values needing improved protection are also being identified in Healy Village. Backhauling of empty fuel drums, excess equipment and supplies will begin. Equipment: There are 2 light helicopters currently assigned to this incident; plus 1 medium helicopter is based here and available, unless needed for initial attack of a new fire or other higher priority use. In addition, 1 air attack aircraft is based in Fairbanks and assigned to this incident. Other resources: 1 Type 1 Crew, 4 Type 2 Crews, 2 Dozers, 12 Boats, and 1 Water Tender. 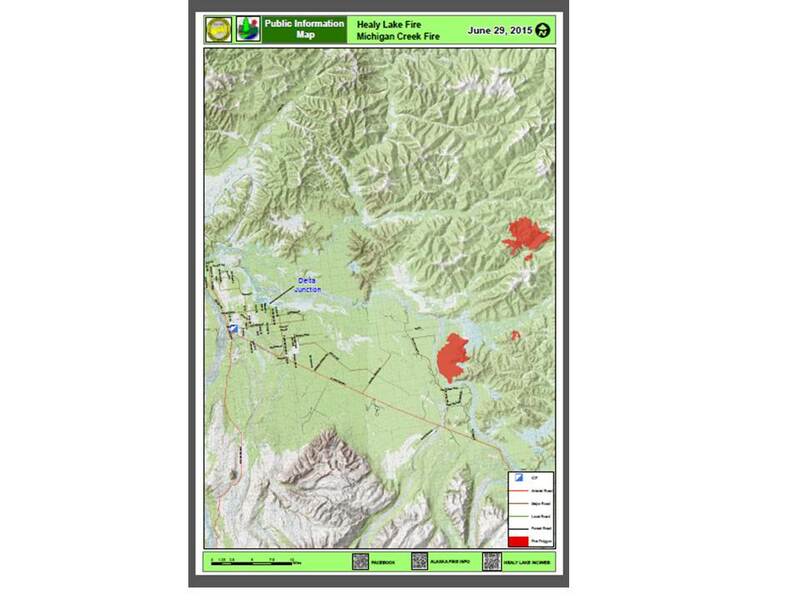 Restrictions and Closures: A temporary flight restriction (TFR) is in effect over the Healy Lake Fire. The public is reminded that NO burning is allowed. For information regarding restrictions visit http://www.akfireinfo.com. Fire Weather: Warmer temperatures, high of 71 with sunny skies today. Tomorrow s forecast calls for continued sunny skies and temperatures in the low 70s.